With regular dental examinations we can watch for signs of decay so that small problems don’t become BIG ones! Whether we like it or not, tooth decay attacks children’s teeth too for any number of reasons. Primary teeth that become decayed can affect the permanent teeth beneath them. Decay in a baby tooth can spread to the permanent tooth as well. It’s important that you arrange for your child to be seen at Ian Barwick, DMD every six months from the time he or she reaches the age of one year. With regular dental examinations, we can keep an eye on your child to watch for signs of decay so that small problems don’t become BIG ones! Call us to schedule a visit for your child or to check to see if one is due. What Options are Available for More Severe Tooth Decay? Children’s teeth are really no different than adult teeth, except they don’t last as long. That’s the reason why many parents think it’s okay to just “let them go” and worry only about the permanent teeth. But this is far from the truth! Those first teeth perform very important functions. They help your child chew food, learn to speak properly, and they help your child’s self esteem by providing a great big toothy smile! 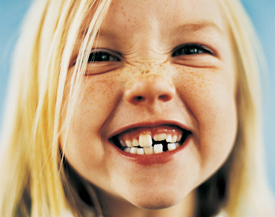 Sometimes your child’s teeth require a restoration beyond just a filling. Since children’s teeth are so much smaller than adult teeth, it really doesn’t take a lot of decay to have this happen. When we mention “crown” to many parents of young children, they often give is a very quizzical look! But, we strive to save a baby tooth in the same way we do adult teeth for many reasons. So, when we suggest a crown, we’re not trying to “pad” your bill or perform an unnecessary procedure; we’re trying to save your child’s tooth and make it as strong as possible for the length of time that tooth remains in his or her mouth! Stainless steel crowns protect back teeth until they fall out. The location of the badly decayed tooth dictates the type of crown that we use. Ready-made plastic crowns, that closely match your child’s other teeth, are used on front teeth that are badly decayed. 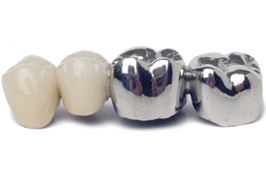 When a crown is required on a molar, we use stainless steel crowns. They are the most durable for the teeth that do most of the chewing, and since they’re in the back, the cosmetic appearance is not much of an issue. At this point there really isn’t a very good “white” option for rear primary teeth. How Can I Avoid Crowns on My Child’s Baby Teeth? You can start by introducing good oral hygiene habits at an early age when the first tooth appears! In addition, you can make sure your child avoids all type of sticky foods (i.e., taffy, licorice, “gummy” snacks, and gum), hard candies, and chewing on ice cubes. It’s also a good idea to start regular dental visits once your child is one year old. Preventive dentistry is really the best kind, and the kind we at Ian Barwick, DMD like best as well! Please give us a call to schedule your child’s dental examination and cleaning. We really love caring for our littlest patients!